Markus Pauni, Uusimaa’s regional government reform Project Strategy Director, has some challenging work in front of him. He is leading the preparation of strategy for Finland’s largest regional government reform project. The project is by no means unanimously supported. The preliminary report on the RDI management model brought clarity to a complex whole. “The basic building blocks have been outlined in words and drawn into pictures. Now it’s good for us to take it from there,” Markus Pauni declares. Image: Uusimaa2019. A total of 1.6 million people – whose lives will be impacted by the renewal – reside in the region. Old jobs are disappearing and new ones are coming into being. A large, complicated reform always gives rise to uncertainty. 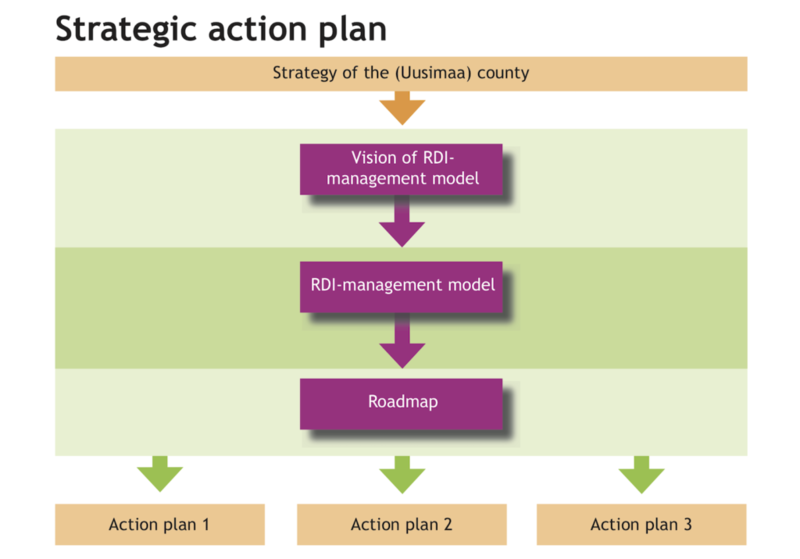 Markus Pauni, Strategy Director of the Uusimaa2019 project, which is preparing the regional government reform in Uusimaa, is of the view that the research, development and innovation (RDI) operational programme represents one of the most pivotal forms of strategic implementation in the region. Indeed, the Uusimaa2019 project implemented competitive bidding at the end of 2017, by which a partner was sought to help design the RDI management model. The combined tender submitted by Innoman and Laurea University of Applied Sciences won. “They had a good tender. The quality points also increased due to the fact that they had a significant consortium. The co-operation of Innoman and Laurea was a big factor for us, since a regional actor was involved, and there was the expertise thereby obtained,” Mr Pauni says. It was the first collaboration between Innoman and Laurea. Innoman’s Pekka Berg, on the other hand, has a very long history with Laurea via Aalto University. The co-operation between Mr Berg and Vice President Kyösti Väkeväinen, who is responsible for Laurea’s research, turned out to be fruitful in this project. Nor will it remain the last one. “What was most rewarding was to get to develop new RDI operational modes for the Uusimaa area together with the Uusimaa2019 project, as well as with other RDI actors in the region,” asserts Kyösti Väkeväinen (on the right). Pekka Berg (on the left) is delighted with the smoothness of the co-operation. ©Innoman / Linda Lipponen, Lifu. 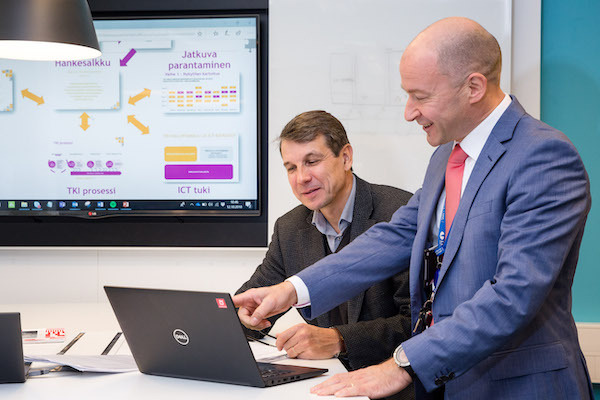 The collaboration between Innoman, Laurea and the Uusimaa2019 projects began with discussions setting out the specifications, in which the project plan was made more precise and divided into stages. All parties are of the view that time should be given to further specify the terms of the co-operative project in order to establish a solid plan. This is the foundation for the entire project as well as for genuine partnership. “In the beginning, I had some doubts as to what could come out of all this. However, after we got through enough discussions, a common thread was found between us,” Mr Pauni relates. Content expertise from the Uusimaa2019 project was already available from their own resources. Innoman and Laurea brought along their perspectives as experts in RDI processes. “We talked the matters through so that we would definitely understand each other. It was then easy for me to monitor the project in my capacity as the client to ensure that the agreed objectives would be realised with the resources agreed,” Mr Pauni explained. Innoman’s Pekka Berg relates that his perspective was strengthened with regard to how important the vision of the managers is in large transition projects. The RDI management model-based work was indeed launched by shaping and moulding the vision. When the vision is clear and simply described, it is easy to communicate to all participants. “Markus Pauni is one of the best clients I’ve ever had. He has his own perspective and vision, but he’s also quite open and flexible to all of our suggestions. We considered, in a constructive spirit, the aspects in which our model is a good one, and where development is still required,” Mr Berg says. The starting point was to delineate a model of practice in organising research, development and innovation operations. Mr Pauni emphasises that a preliminary report was concerned, not a final model of RDI management. The purpose was to get a start at formulating what is a complicated matter. The largest specific challenge in the regional government reform as a whole is its complexity. “We examined the elephant from trunk to tail and established the fundamentals, basic concepts and basic processes for our continuing efforts,” Mr Pauni says. The RDI management model was hammered out by a large group in the spring of 2018. For the purpose of the report, 25 expert interviews were conducted, and six workshops were conducted. A total of 42 experts from Uusimaa’s regional organisations participated in the workshops. Those participants were from, for instance, the cities of Helsinki, Vantaa and Espoo; HUS Helsinki University Hospital; the Centre for Economic Development, Transport and the Environment; the University of Helsinki; and Aalto University. “There was no question in my mind. I knew the core group in regional preparation would become an essential part of the workshops. It was an unexpected pleasure that the partners from other organisations also got actively involved. The organisation of interaction between the various parties succeeded well,” Mr Pauni points out. If, as a basic assumption, there is opposition to the entire regional government reform, everything linked to its planning also easily becomes an opposition target. The planning of the RDI management model faced critique as well. The only possibility, however, to make progress is to really think about the future together. The handling of the workshops’ themes required extensive expertise across the various organisations. Those who oppose the regional government reform were also invited to join in. Mr Pauni is grateful for the functionality of the workshops. After the participants were successfully attracted to join in, the work generally started going smoothly. Adequately defined and limited task assignment is important in the workshops. When the working process in small groups is well-organised in accordance with the guidelines and themes, people begin to function in a productive manner. The new planning pulls people in, and this is the best feedback for the leaders of the workshops. “There’s a great feeling of success when you see that results are being achieved and folks are genuinely enthusiastic about the results,” Pekka Berg notes. Most of those taking part were already familiar with each other from various connections before, but were now brought together for the first time from the regional government reform and RDI management model teams. Participation in the workshops provided the participants with a wider perspective on renewal, even if it did not immediately change opinions. “In the workshops, you get an understanding of how a potential new region intends to approach matters – and if it’s possible to affect it internally, it’s a positive thing for everyone,” Mr Pauni says. Markus Pauni is satisfied with the final outcome. The RDI management model-based preliminary report was built on a strong foundation on the basis of which it is good to continue. The most important benefits can be distributed into two parts. Now that the impetus linked with the structure, processes and management of the projects has been initiated together with Innoman and Laurea, the Uusimaa2019 project will continue independently. In the new region’s RDI policy programme, there will be a closer investigation into content, priority areas and financing. After this, establishing these aspects in practice will be initiated. The RDI management model was made at an uncertain time from the perspective of regional government reform. It is possible that the entire reform will collapse. On the other hand, Markus Pauni believes that the reform will take place sooner or later in one form or another. In Mr Pauni’s view, the planning of the RDI management model is not going to waste, even if the reform gets transferred to the future. “In the RDI management model, the perspective of the regional organisation’s management is first priority, but next is the ecosystem perspective. It will apply in the future as well, since the matter will be considered regardless of whether or not it is part of the service region now being planned. The RDI management model is useful even if the structure turns out, as time goes on, to be different,” Mr Pauni asserts. A professional builder’s reliable partner Naulankanta Oy has been in rapid growth in Finland, and is now about to expand also into international markets. The developing business activities of the enterprise have imposed a challenge to change old working methods and information systems to fit in the new situation. Innoman has helped Naulankanta to develop the business strategy and productization, and also to design an internationalization plan. 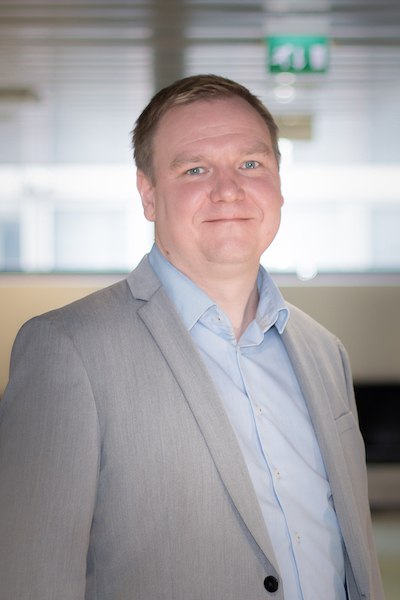 The crucial part of RKM’s collaboration with Innoman has been trust, says Ismo Penttilä, Managing Director of RKM Group. You woke up to a world that is no longer the same as yesterday.